Like most properties with a visual novel at the core, Fate has had a rough time gaining exposure outside of Japan. Most people know of the story through Studio DEEN’s mediocre anime adaptation. Given the nature of original creator Kinoko Nasu’s writing, few fans have risen to the occasion to translate the esoteric media associated with the series without eventually losing interest half-way. Only a handful of actual Fate products licensed for Westerners exist, including a laughably overpriced Bu-ray box set for Fate/Zero that serves as a reminder of the disparities in how the Japanese do business with consumers in contrast to American publishers. I’d venture to say there is a sizable following for the franchise, but the marketability of Fate is still largely untested. 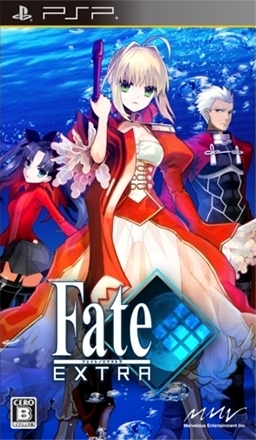 Aksys Games are among the first since Geneon’s Fate/Stay Night (F/SN) DVD release to take a significant shot at it by releasing Fate/Extra (F/E) for the gracefully aging PSP. Fate/Extra is an RPG much in the vein of the later entries in the Persona series. You assume control of a blank-slate protagonist who finds himself involved in a single-elimination tournament for the Holy Grail for reasons he cannot remember. Gameplay breaks down between information-gathering in the school-themed central hub and commanding a Servant, a supernatural being, to fight for you in the tournament. F/E follows passage of time mechanics similar to Persona, assigning you time-sensitive tasks to do before progressing to the next elimination round. Now, I happen to love the Persona games, so I’m painfully aware of every moment F/E doesn’t meet the standards set by the game it emulates. To start with, the environments (the school and the arena) aren’t all that interesting, and you’ll stare at them for hours as you run through the game. The arena is simply a collection of sparse corridors that don’t serve much purpose other than to hold an enemy encounter, treasure, or scripted event. The school is equally lifeless, especially once the number of NPC combatants is reduced by the end of the tournament. While the level design is lazy, it has nothing on the Extreme Rock-Paper-Scissors battle system. It’s a major letdown to learn that the Servant fights that awed me in the original visual novel have been reduced to a guessing game wherein you input six commands each turn (attack, break, guard, or a selection from a list of skills) and hope for the best. You can easily throw away an hours worth of playtime by not playing like a coward. After a while, Servants will familiarize themselves with enemies and telepathically figure out the enemy’s command order, at which point you can turn off all thinking processes and grind until the enemies stop dropping worthwhile XP. So the gameplay isn’t all that great, but at least the story and writing should be good, right? Nasu’s name is prominently featured on the back of the box underneath a screen shot, which is more credit than what most writers involved in games can hope for. Unfortunately, Nasu takes it easy with this one. The only characters that are remotely interesting are the three playable Servants and characters with existing ties to the Nasuverse. The F/E originals are surprisingly clichéd and difficult to sympathize with in their dying moments after having remorselessly delivered a beating on them.The principle antagonist for most of the game is a snotty kid who happens to be the king of the world and spends most of his appearances giving condescending advice to your character, who takes it like a punk. Really, that’s the extent of the relationship with what you’re led to believe is your greatest foe for over 25 hours of gameplay. Everything is scripted so that you’re never at a loss of where to go, who to talk to, or what item you need to overcome any obstacle that comes up, and everyone is more than glad to help your amnesiac protagonist against his incompetent and stagey opponents. It’s so straightforward that it prevents interesting developments in the story. 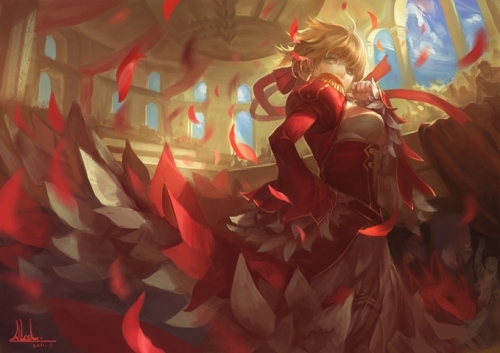 I never really felt like my choices had any impact on my character’s development, and forging a bond with your Servant essentially comes down to “Did you talk to your Servant today?” This is essentially the opposite of my experiences with the visual novel, so I wonder how much involvement Nasu actually had in writing the scenario for the game. There are choice moments where the Fate spirit shines in the game, though. Saber Extra’s dialogue and vocal performance is excellent throughout, pretty much single-handedly justifying F/E’s inclusion in the Fate canon. Caster is worth a playthrough for seiyuu fanatics interested in having voice actress Chiwa Saito refer to them as “master,” even if she’s the weakest servant and requires hours of tender, loving grinding to compete in boss fights. I haven’t yet steeled myself for a third run of F/E, but I imagine Archer is just as wonderfully a jerk as he was in F/SN. Though I wish the game would make a proper name for itself, all of the call-backs to other Type-Moon properties are amusing. The Noble Phantasms are as flashy as the PSP can hope to muster, and the remixed F/SN music tracks let you know that its about to go down right now. Aksys Games did see fit to give this game a proper showing here in America with its own limited edition release in a big cardboard box that seems to be the fashion with PSP RPGs lately. The extras are typical fare for a release like this: a small art book and an incomplete soundtrack CD. It’s a really nice art book, though; the hardcover binding and paper stock are above what’s usually done for bonuses like this. I’m only a little (very) upset that the Saber Extra figma from the Japanese release isn’t included, but I suppose licensing deals and price and all those other bothersome factors came up. So Fate/Extra didn’t manage to become my favorite game despite being a Persona clone with Servants in it. The game is a "fans only" experience that often feels like a chore. Even so, I will probably buy the sequel from Aksys or whoever publishes it in America, regardless of all the bad things I’ve said about the first game. I feel responsible to let publishers know there is a market for Fate in America, so I am compelled to vote with my dollars (though Aniplex won’t see a dime of that, let alone $700 to own the complete Fate/Zero collection). I optimistically await to have nothing but good things to say about the sequel.